Lie the ends of the two lines against each other, over- lapping about six inches. Double about five inches of line, and pass through the eye. 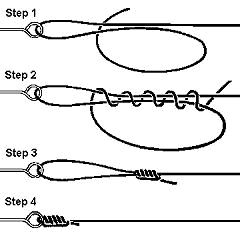 Tie a simple Overhand Knot in the doubled line letting the hook hang loose. Avoid twisting the lines. Use the loop to wind tight coils around the shank and both lines, from the eye upwards. Use from 5 turns. Lay the two lines against each other, overlapping about nine inches. Working the two lines as one, tie an Overhand Knot. It will be necessary to pull one line (the leader) completely through this loop. Lubricate the knot with saliva or knot lube and cinch tightly. Pass a six inch loop of line through the eye. Bring the end back on itself, passing it under the doubled part. Pull the tag end tight to form the knot . 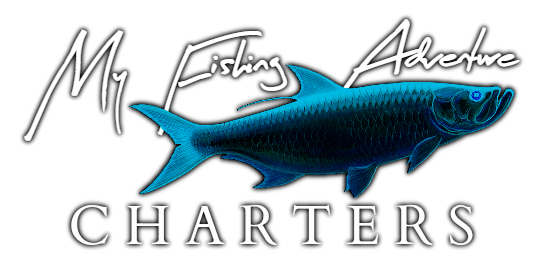 Continue pulling to cinch the knot down against the eye of the hook or swivel. Overlap the two lines for about six inches. Pass the end six to eight times around the two lines. Pull the tag end tight to form the first knot. 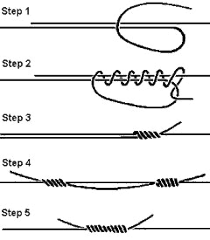 This is one of the few knots where you begin the knot before you insert the line in the hook's eye. 2.Make the recommended number of turns with the tag end around the standing line. 4) Draw on the tag end until the knot forms together. Then pull on the standing line to close the knot well. Finally, pull on both the tag end and standing line to assure the connection is as tight as possible. 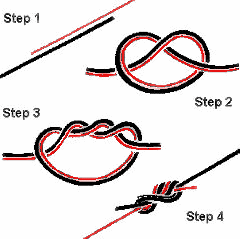 1) The smaller the overhand knot, the smaller the loop. 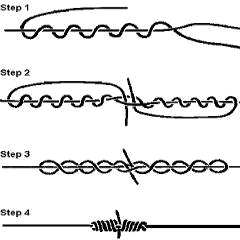 For small loops, try to make the overhand knot no more than 3/16 inch in diameter (about the size of a large split shot. 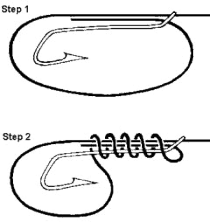 2) Once the tag end has been inserted through the hook eye and back through the overhand knot, hold the overhand knot lightly, and pull on the tag end. This will carry the overhand knot down near the hook eye. 3) When finally closing the knot, pull out as much slack as possible between the tag end and standing line.